Give your dining table a makeover with these fun fabric tablemats. Made from either thick soft twill fabric or wipe-clean matte oilcloth, they can easily be rolled up and stored away when not in use to keep your home nice and tidy. Choose between two equally stunning materials and print your photos, text or design to create your own unique placemats. 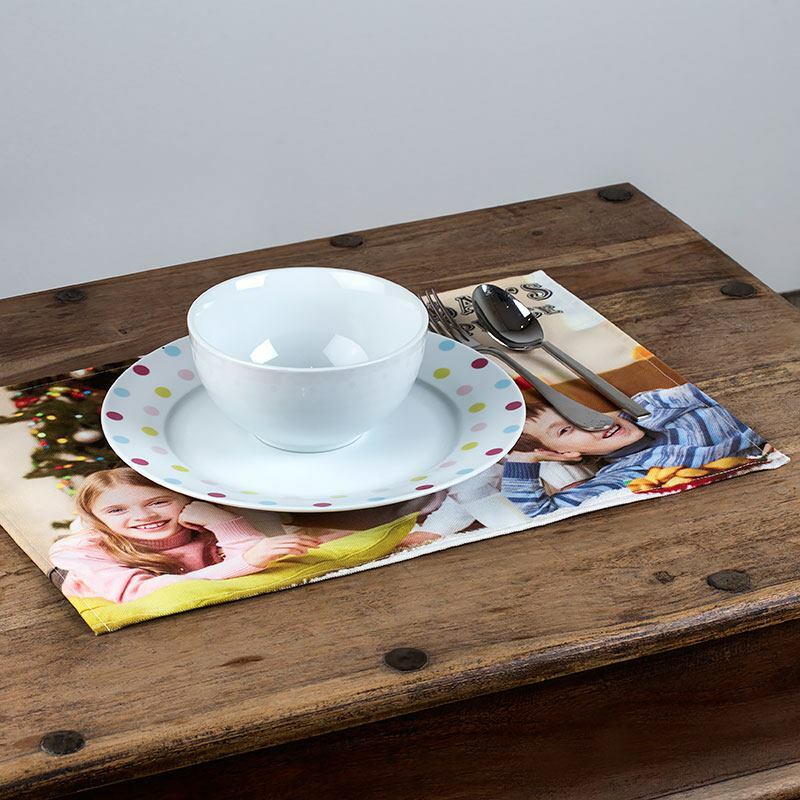 Made from a single layer of our thick soft twill textile or easy clean Oilcloth matte, these flexible tablemats take up less storage room and can go in the washing machine, unlike traditional table settings. Because they’re fabric, it means they’re bigger in size so you can fit your glass and cutlery on there as well as your dinner plate – no more messy marks on the table! We handmake all customised placemats in London, UK, printing your designs onto the chosen fabric, cutting to size and hand-stitching together. The digital printing process we use ensures your images won’t crack or peel, even with washing so the placemat fabric can literally be passed down generations! Service was very good and very easy to order. Overall very pleased but did think the edging of the mats was a bit wobbly in places. Two placemats were exactly what I wanted. Couldn't’ Fault the excellent service. Excellent quality place mats from my photos. Good communications and swift delivery. I could not be more pleased and wouldn't hesitate to use the Bags of Love service again. Highly recommended. Who Would Love to Receive Fabric Placemats? They make original house warming gifts, so treat friends or relatives to their own customised tableware that they can use for their designed purpose or simply treasured as a keepsake. Big gatherings or events would benefit from these personalised placemats. Scattered over tables they would help spread a message or raise brand awareness. Like many of our products, the fabric tablemats come with a quantity discount so buy more than one today and save money. The last thing anybody wants is to find fibres in their food so we use a single layer of fabric and hem the edges to prevent fraying. Your photos or design are printed edge-to-edge on the front to give off a bold teatime statement. Both fabrics produce a vibrant print, and the Oilcloth matte doesn’t develop a cracked patina over time so remains smooth even after heavy use. The placemat is your canvas so go as mad or as mellow as you like! The edges are hemmed which means only a fraction of your design will be lost, so try to keep the main features of your photo away from the hem areas. Print a placemat for each family member, featuring their face and name. This will put an end to any disagreements over who sits where! You could even go down the star sign route and print each fabric table mat with everybody’s individual sign and characteristics. For families with duplicate signs, customise it to the person, so Dad and Son, or His and Her. For unique wedding favours, personalise these gorgeous fabric placemats with your guests’ names and a thank you for helping to make the day extra special. To customise it even more, feature a monogram of you and your partner’s initials, keeping it in line with your wedding colour scheme. Because they are easily folded, they’ll fit into most handbags so guests don’t need to worry about carrying around an extravagant favour. The imagination of a child is something beautiful, so encourage creativity and learning even at the table by designing a fun game to print on your custom fabric placemat. For fussy eaters, this could turn dinner time dramas into tea time triumphs! When the festive season is near, these make great personalised Christmas placemats. Choose a traditional nativity scene – perhaps a photo from your child’s school play – or create a set, each one printed with a different image relating to the holiday season. I.e. snowman, elves, Christmas pudding, drummer boys etc. And because they’re easy to clean, it doesn’t matter if a little cranberry sauce tries to escape your plate!